Lilly — as Walt always called her — quickly came to understand that she wasn’t the only love in Walt’s life; he had deep feelings for his work as well. 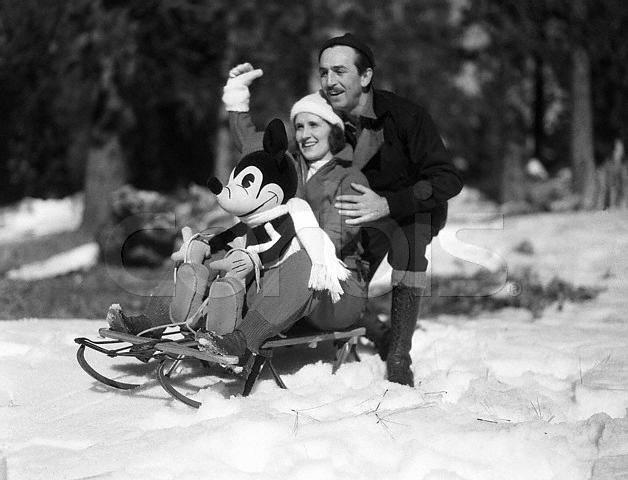 They’d spend a pleasant evening out together with friends or family, and inevitably Walt would announce, “I’ve just got one little thing I want to do at the studio.” Next thing Lilly would know, she was being awakened on the office couch in the middle of the night — Walt had been working for hours — and it was finally time to go home. The Alice series was pretty successful. But M. J. Winkler had turned over her company to her husband, Charlie Mintz, and Mintz was a tough customer, frequently chastising Walt. When the Alice series was no longer in sufficient demand, Walt started to work on a new character, Oswald the Lucky Rabbit. Ultimately, however, the rabbit wasn’t going to be so lucky for Walt. As Oswald’s stardom grew, Walt decided that he could renew the contract for the cartoons at a better price. So he and Lilly headed off for New York City to cut a new deal. But there was a lot Walt didn’t know as he blithely headed east. He didn’t know that Charlie Mintz had offered Walt’s staff more money and freedom if they came to work for him. He didn’t know that most of his staff had accepted. Most important, he didn’t know that Charlie Mintz — and Universal Pictures — really owned the legal rights to Oswald. It may have been Walt and his staff who had turned Oswald into a star, but Mintz and Universal held the star’s contract! Mintz demanded that Walt give up his own business and work exclusively for him. Walt refused. Mintz was unrelenting. And Walt left New York without most of his staff and without Oswald. Before boarding the train home, Walt sent Roy a telegram: “LEAVING TONIGHT STOPPING OVER KC ARRIVE HOME SUNDAY MORNING SEVEN THIRTY DON’T WORRY EVERYTHING OK WILL GIVE DETAILS WHEN ARRIVE — WALT” But while Walt was trying to protect his brother from the real story, it would appear that his mind was already working on a way to make the telegram true by the time he arrived home. As Walt told the story of that now famous trip to Los Angeles, he knew that he had to come up with a new character. And so he dreamed up the idea of Mickey Mouse on the way home. At first Walt thought he’d call his new creation Mortimer. But Lilly didn’t like that name. “How about Mickey?” she asked. As hundreds of millions of fans now know, he took her advice. Soon after Walt got home, he began creating three cartoons starring his new featured player.